Learn how to value and analyze stocks effectively. Liquidation valuation, net net stocks, and when trying to determine the stock price relative to a stock's net assets. Does not work well for service or low asset companies such as software. When Ben Graham was around, the main types of businesses that existed were industrial businesses. Mainly factories, manufacturers and retailers. There were no consulting, software, or high tech companies you see today. He would analyze the balance sheet and invest in stocks with high tangible assets as it protected the downside. Cyclical companies, volatile cash flows, growth stocks, and young companies investing in growth. Ben Graham was a balance sheet investor first and foremost, but he created this formula to simulate growth investing with value investing principles. Companies with consistent free cash flow, predictable companies. It has its weaknesses and advantages which is discussed in the link below, but overall, it is a highly effective stock valuation method to value predictable companies. Making realistic projections to test a range of valuation scenarios is key. Any situation when you want to figure out what the market is expecting from the stock. A backwards stock valuation to find what the market is expecting from the stock. Instead of entering the future growth rate, the goal is to find out what the market is expecting the stock to achieve. Instead of basing your stock valuation on what a competitor is being valued as the benchmark, the multiple is calculated based on the business fundamentals. Created by Vitaliy Katsenelson, author of ACTIVE VALUE INVESTING. Used by many on Wall Street and a good back of the envelope stock valuation method. It has the advantage of being simple and concise. EBIT is the main driver of the valuation which makes it applicable for all companies. Calculate asset value by making adjustments to the balance sheet. Also used to see how much a competitor would have to spend in order to replicate the company's business. In a way, this is a health and moat test. If the value of the balance sheet after making adjustments is strong, the company is protected by its assets. This value makes it easy to identify the floor for the stock. If the asset reproduction value is high, then new entrants will have difficulty entering the market. For all companies but even better for cyclical, volatile, and young companies. This stock valuation method is best used in conjunction with the Asset Reproduction Value method. It is a technique for valuing stocks by making an assumption about the sustainability of current earnings and the cost of capital. The version used at old school value does not factor in any growth. 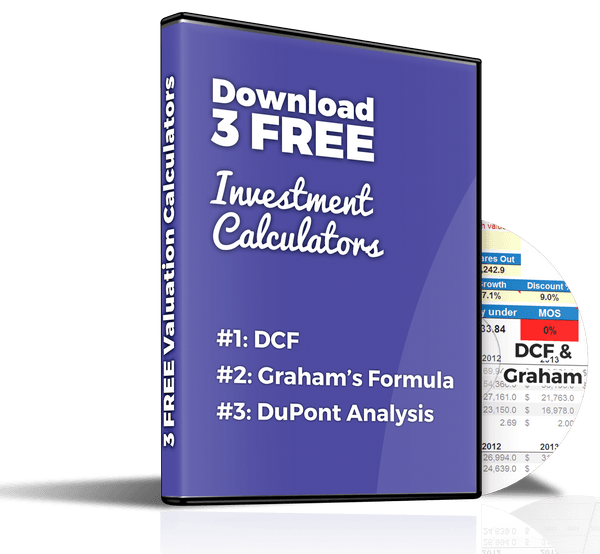 Start using the 3 free investment calculators to improve your investment returns. I'll also send additional value investing downloads and resources.